Linda: Alice, it’s so nice to have you. Thanks for joining me today. You’ve got a new book out which is always exciting. This one is titled The Wedding Barter. Where did you get the inspiration for the story and how did you come up with the title? Alice: Hi, Linda, thanks for inviting me to join you. Late last August I was asked if I would like to join a group of authors from my publishing house, Forget Me Not Publishers, in writing a novella for boxed set (now available on Amazon—Trying Out for Love). In the beginning, the stories were going to be joined together under the idea of a “bridesmaid’s auction,”—inspired by an article one author found in the paper. Not only had I never done a “piece of the story” like this before, but my genre has been mystery/suspense, so writing a romance was really a stretch for me. Though I found the idea intriguing, I really didn’t think it would be the right venue to pursue. But, after the scope of the novellas changed to stand alone books, I softened. Within a few weeks, the germ of an idea was gifted me after some time in prayer, along with the title. Gotta love how God works! LM: Research is an important part of writing any book. What sort of research did you conduct for this book? Alice: For a short novel—49,000 words—there was more research than I’ve ever done before. And it was mostly on the fly as I dictated—cold turkey, no notes or forethought—to my husband. It’s the first time I could actually call the Internet my friend! From the Army, to PTSD, IEDs, traumatic brain injuries in general, to getting the correct name for Avon pieces my children and I owned in the past, we were constantly looking things up and trying to learn all we could. I even got four or five books on barn architecture from our local library so I could learn a little about both the interior and exterior of the structures. I’d always wanted to know what to call my favorite style and quickly learned about the “gambrel roofed barn.” My publisher found the perfect example of it for Barter’s cover! LM: You’re a prolific writer. How do you decide what project or genre to start next? Alice: Honestly, I don’t know any other way than to let God lead me. If He isn’t on board, it’s not going to happen. Right now—after almost ten years—the third in The Bouncing Grandma Mysteries is on the agenda. LM: What is your favorite childhood book? Favorite season: any that isn’t too hot! Alice: A good deal of what Riley—the lead character in The Wedding Barter—describes about her brain injury is from personal experience. Alice: A cozy mystery called The Case of the Stolen Identity, a Bouncing Grandma Mystery. 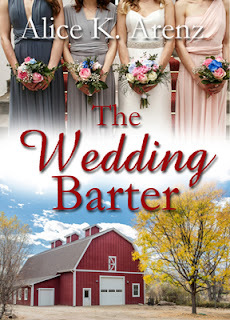 About Alice: Though Alice K. Arenz is known for her cozy mysteries and romantic mystery/suspense novels, the Carol Award winning author has branched out with her newest release, The Wedding Barter, a romance that is both serious and funny. Arenz is a member of American Christian Fiction Writers. 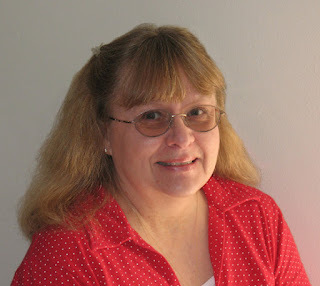 Her first three novels were honored by two finals and one win in ACFW’s Carol Awards: cozy mysteries The Case of the Bouncing Grandma (a 2009 finalist), The Case of the Mystified M.D., (2010 winner), and mystery/suspense Mirrored Image (a 2011 finalist). These novels have been followed by An American Gothic, Portrait of Jenny, and short story, Home Cookin’. About The Wedding Barter: Riley Carr has been best friends with Amy Lawton since they were toddlers. While Amy awaits her discharge from the Army, Riley's been left in charge of helping to arrange "a very small, intimate ceremony with no fanfare" for Amy and her fiancé. But, Riley has something else in mind. Nice interview Linda, always fun to discover new writers. That's been one of the things I've enjoyed over the last couple of years in being part of the CelebrateLit Blogging team. I've found tons of new authors that I love!